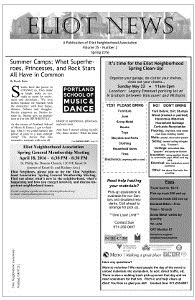 The Eliot Newspaper is a publication of the Eliot Neighborhood Association and has been published for the past 22 years. In recent times, former Board Chair Clint Lundmark has been the Editor, Advertising contact, Layout manager, and a major content creator for the paper. This is a tremendous amount of work for one person—too much for me—to do as I am quickly finding out, and I would like to thank Clint for the amount of work he has done for the paper over the past year.